Unlike the 1904 Yellowstone poster by the Northern Pacific Railroad, this 1930 poster by Edward Brewer has very small Northern Pacific logos on the bottom of it. 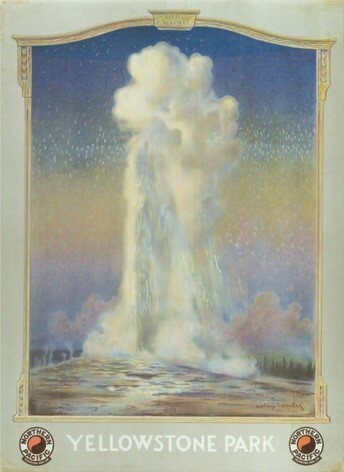 Old Faithful geyser, which appeared in a small scenic cut out in the 1904 poster is now the center of attention here. It’s a powerful and prominent painting and the use of an elegant frame design to crop the scene helps to enhance the wonder of the geyser. At this point, advertising the sights of the National Parks called not on vivid descriptions of the sights, but instead on beautiful art that did justice to the amazing wilderness.